It started in 1997 and ran until 2007. I was 11 years old in 1997. I was 21 in 2007. That’s two high schools, college, university (including a course-swap) four (I think) housemates, all of Buffy the Vampire Slayer, all of Farscape. My first convention, Final Fantasy VII through XII (and who knows how many spinoffs and remakes, not to mention Advent Children), and half of my relationship with James. So! 2012 has been a busy year! October saw me trekking off to London for MCM Expo. (I got my photo taken with Warwick Davis!) I also got to visit the Sherlock Holmes museum while I was there; let me tell you, that Moriarty mannequin is every bit as terrifying as I’d been lead to believe. Ugh. Who is this dork in the deerstalker anyway? Then we got introduced to a game called Johann Sebastian Joust. Which is just… ridiculous amounts of fun. especially when people start forming alliances to take down the other players. The 12th was launch day for Big Sky Infinity; the PS3 and Vita versions of Really Big Sky. If you own either of those consoles and don’t already have it, get moving! And now it’s onwards to game development and awesome secret projects that I am dying to tell you about. Muahahahahaha. And all that. Fangirling ahoy! If you don’t want to read 300+ words of “Yey! Assasin’s Creed!”; move along. Sooo, Assassin’s Creed: Revalations arrived (which is not where I’ve been all week – just some of it :P). There might be some small spoilers in here, (mostly of the “this person exists” variety.) But I’ll try to keep the really big plot specifics out of things. I have to say, I’m really enjoying it so far. There’s a lot more “day-to-day running of the brotherhood” stuff as opposed to building it up from scratch or going from one mission to the next. I may actually finish this game in tears. I have to say though, the melancholy is there, but it’s not focused on to the point of being an over-angsty mess. There’s just a general “end of an era/passing the torch” feeling; which is appropriate with ACIII on the horizon. (Part of the soundtrack is actually called “passing the torch”, and it’s gorgeous.) There’s the humour moments too, mainly Ezio flirting with women, every other sentence Yusuf says, and not forgetting; the Shirley Templar. (It’s a Shirley Temple with gin, apparently). ACIII is out in October, so I’m trying to pace myself to beat it before that comes out, but not with so much time to spare that the inevitable evil cliffhanger drives me crazy. 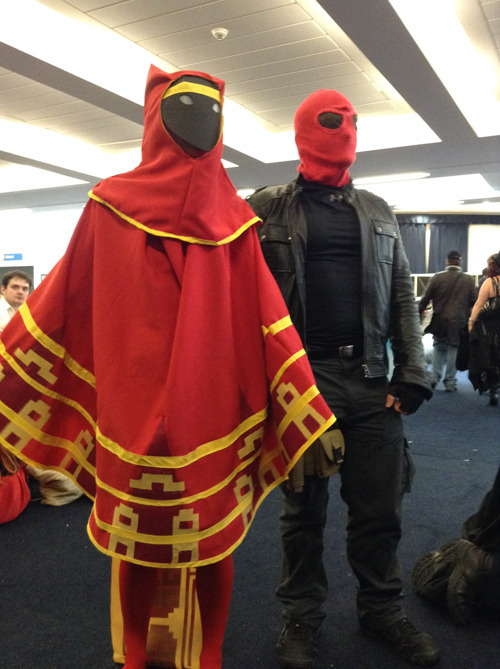 Rounding off the two months of insane busyness, last month was the return of the Manchester MCM Expo. This was my third convention, and my second attempt at cosplaying; this year I was Erza Scarlet, from Hiro Mashima’s Fairy Tail. And here’s a photo of me, in costume and (sort-of) in character. The skirt was made by my mum. The armour is made from craft foam, shaped and trimmed using my own self as a mannequin, (and that was every bit as hilarious and awkward as it sounds, by the way), hot glued together and then spray painted. It took around three days, in total. Not bad for my second attempt at cosplay ever, (if I do say so myself) though, the armour gave up the ghost on the journey home, so I’m gonna re-build it and use something more flexible than craft foam this time. Stuff kept sliding down my arm or coming unstuck.